Currently listed at The Guitar Hanger eBay Store, this classic shell pink color gives off an early 60's Southern California shower tile vibe, complete with rust and mildew. There's no retro like retro with wear-- especially when it's pink. Personally, I don't do pink. However, the aging aspects do give it an edgier groove machine mojo, and this one ain't gonna get lost in the crowd. 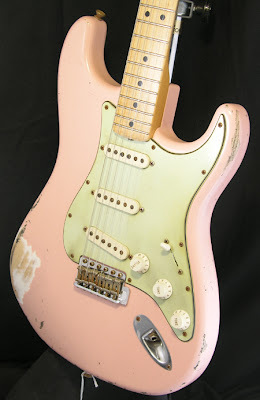 "This 2007 Fender '69 Shell Pink Heavy Relic Stratocaster features an alder body, laminated maple "U"-shaped neck with a 7.25" radius, 21 vintage-style frets, three Custom '69 Single-Coil pick-ups, three-position pick-up selector, Vintage Tremolo, Vintage Schaller tuning machines, chrome hardware, 3-ply white/black/white pickguard, and deluxe black hardshell case."